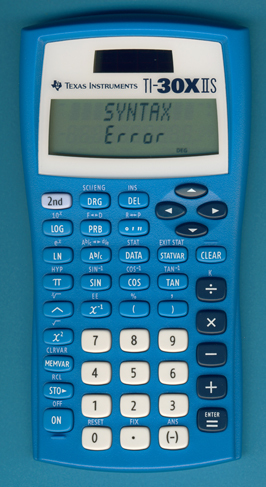 This blue colored TI-30X IIS was manufactured by Kinpo Electronics, Inc. for the retailer Target. It was released for the Back-to-School 2011 campaign together with its maroon, lime-green and lavender siblings and the TI-84 Plus Silver Edition in the colors of pink, blue and black. This design was used in Summer 2011 by four retailers: Target, Fred Meyer, Meijer and Shopko. In Summer 2012 Office Max added the design to its selection. In Summer 2013 six retailers used the design: Best Buy, Fred Meyer, Meijer, Office Max, Shopko and Target (in alphabetical order).